Aerin is an Imperial warrior residing in Riften. He rescued Mjoll the Lioness from outside the Dwemer ruins of Mzinchaleft and nursed her back to health. He spends most of his time following her around. He frequently expresses the desire to travel outside Riften, to see if things are as bad everywhere as they are in Riften. Mjoll: "I had another run-in with the Thieves Guild." Aerin: "Be careful, Mjoll. The Thieves Guild has Maven Black-Briar at her back. One snap of her fingers, and you could end up in Riften Jail... or worse." Mjoll: "They represent the reason I'm here. I can't just ignore them, Aerin." Aerin: "I know. I just don't want you to leave; you're the only good thing that's happened to this city in a long time." He sleeps from 2am to 6am, starting his day with a one-hour breakfast. At noon, he and Mjoll come to the Bee and Barb to eat lunch and converse, staying there for six hours. He spends the rest of his time at Mjoll's side and patrolling the city with her. If Mjoll is currently following you, however, he will instead be found enjoying some time alone at his house. He wears a set of fine clothes and a pair of fine boots. 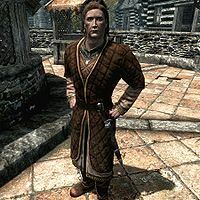 He is equipped with a leveled dagger which can be up to elven quality, and carries a key to his house, as well as a selection of upper-class items and gold. Aerin will gladly accept a bulletin from the Temple of Mara, telling you, "I visit the temple sometimes, but perhaps not often enough. Thanks for bringing this to me." You can also see him give to the poor and say, "Yes, I hope this helps." to Snilf and Edda. He will frequently mention Mjoll: "I've never seen Mjoll this upset about anything. The city really gets to her. ", "Mjoll told me that it isn't this bad everywhere. Maybe one day I'll venture out and see if she's right. ", or "Mjoll's brought me nothing but safety and piece [sic] of mind... and some lessons with the blade." At other times he will muse, "I hope that someday this city will be free from corruption and we can all live in peace." When you bid farewell to him, he will say, "Watch yourself around here, it isn't safe." Likewise, Mjoll can be found talking about him, often in high regard. He seems to be the only person she trusts, and part of the reason she stayed in Riften. She'll tell you, "Corruption, lies and deceit are the order of the day here. If it wasn't for Aerin, the young man who saved my life, I think I'd already have given up long ago." and "It was Aerin who found me dying outside of a Dwemer ruin. If he hadn't brought me here and nursed me back to health, I would have died. When my strength returned and he told me about the problems plaguing Riften, I decided fate brought me here for a reason... so I stayed." Mjoll: "Sometimes I'm not certain that the people of Riften want to be helped." Aerin: "I think some of them do, Lady Mjoll. They're just too frightened to step up and do something about it like you are." Mjoll: "Aerin, you never cease to amaze me. You always see the good in everything." Aerin: "It's only because I've had an excellent teacher." Aerin: "You've been in Riften for quite some time now, Lady Mjoll. I fear that you soon may leave us." Mjoll: "Riften has problems of its own. Now is not the time for exploration and discovery." Aerin: "I'm relieved to hear you say that. If you were to leave, I'd miss you terribly." Mjoll: "Aerin, I owe you my life. It would take a threat to all of Skyrim for me to depart." Aerin: "Well, you were right. These so called 'Gutter Saints' live in the sewers beneath." Mjoll: "I suspected as much. The real question now is do we do something about it ourselves or do we speak to the Jarl?" Aerin: "I say we go down there and clear the place out, just like old times." Mjoll: "No, my friend. That would be reckless. We have to help, but help in a way that doesn't directly place anyone in harm's way. For now, give this 'Ratway' a wide berth." Mjoll: "Aerin, have you seen my ring? The one with the inscription?" Aerin: "No, I haven't. Don't tell me you've lost it." Mjoll: "I hope not. That ring is irreplaceable." Aerin: "I'll look around the house and if I find it, I'll bring it to you right away." There is also a location in Oblivion named Aerin's Camp, though no NPC by that name is present there. If Mjoll is inducted into the Blades, Aerin will eventually relocate to Sky Haven temple. He still talks about "this city" and continues to use his standard Riften-based dialogue. If Mjoll spars with another Blade he'll yell like she was really being attacked. Aerin will also accompany Mjoll and the player on the Blades' dragon hunting quests, where he will be of precious little use in the fight. If you move Mjoll out of Riften (either by marrying her or inducting her into the Blades), Aerin will accompany her. If you marry Mjoll and move her into Honeyside, Aerin will wander around Riften talking to himself as if Mjoll is there with him. Esta página foi modificada pela última vez à(s) 01h13min de 10 de agosto de 2015.